The Chronicle of Cultural Misandry: Exposing the Feminist Conspiracy to Demonize Video Games and Male Gamers. Exposing the Feminist Conspiracy to Demonize Video Games and Male Gamers. Feminist Icon Anita Sarkeesian who together with SJW Jonathan McIntosh, run the feministfrequency.com page, which is dedicated to supposedly expose the sexism and misogyny in video games and the gaming community. Other feminists borrowing from her claims, also preach that video games normalize sexism and violence against women and typically some reference to Anita Sarkesian's videos are used as "proof" that video games contribute to a culture of misogynistic violence. Here, they right off the bat, that video games were created more towards boys, but they complain it's not inclusive, which doesn't make sense to complain, since they already admitted in her premise it's a boys' club, why would it be inclusive then? According to their faulty logic. And on page 3, they completely contradict themselves. They claim girls are half of the demographic of gamers and buyers of games, but games are not inclusive? Now on page 4 of the pdf, you can find a link to one of Anita's videos where offers anecdotal and subjective evidence to her harassment and that of what of other women. She cites no numbers of police reports where threats have been verified and arrests have been made, confirming the epidemic hate she and other women face in the gaming community. And right below, are the leading questions they further will ask the students based on that poor evidence alone of how women are hated in the gaming community. Here's a video by her associate Jonathan McIntosh with other anti-GamerGate video game journalists and developers using logical fallacies and confirmation biases to sell us that men have "invisible benefits" white gaming. "A weasel word (also, anonymous authority) is an informal term for words and phrases aimed at creating an impression that a specific and/or meaningful statement has been made, when only a vague or ambiguous claim has been communicated, enabling the specific meaning to be denied if the statement is challenged.The use of weasel words to avoid making an outright assertion is synonymous to tergiversate. Weasel words can imply meaning far beyond the claim actually being made. Some weasel words may also have the effect of softening the force of a potentially loaded or otherwise controversial statement through some form of understatement, for example using detensifiers such as "somewhat" or "in most respects".Weasel words can be used in advertising and in political statements, where encouraging the audience to develop a misleading impression of what was said can lead to advantages, at least in the short term (in the longer term, systematic deception is likely to be identified, with a loss of trust in the speaker)." And to counter-act their ambiguous claims, famous YouTuber and anti-feminist Karen Straughan, uses facts and logic to debunk their dishonest claims. You can watch part 2 right on the side. When we think of online harassment, we have been conditioned to conjure up images of the female gender receiving most of the harassment. And certainly women do receive their fair share of harassment especially in terms of messages from people infatuated with them. 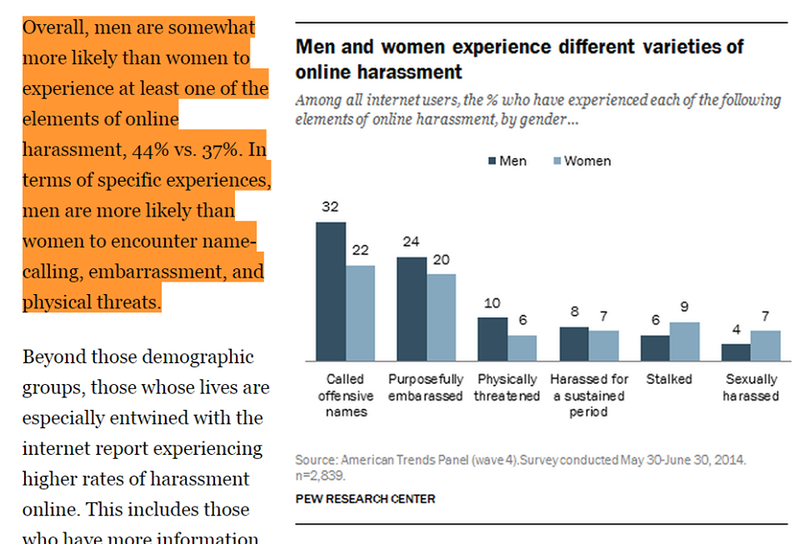 "Overall, men are somewhat more likely than women to experience at least one of the elements of online harassment, 44% vs. 37%. In terms of specific experiences, men are more likely than women to encounter name-calling, embarrassment, and physical threats." 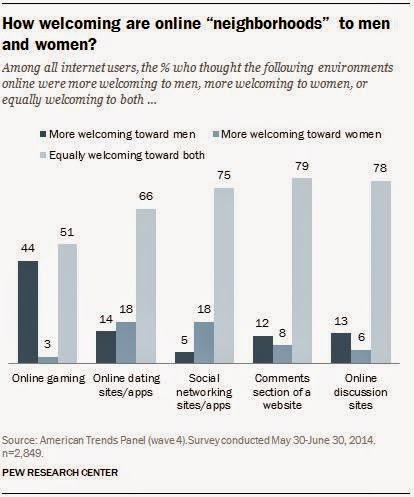 If men receive most of the online threats? 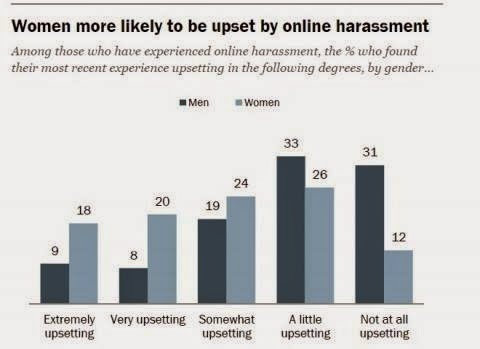 How come we don't ever hear feminist s like Anita Sarkeesian and Social Justice Warriors like Jonathan McIntosh speaking out against this greater number of harassment towards men? Don't they belong to movements that supposedly promote equality and justice for all demographics? "From the oversexualized characters in fighting games, such as Dead or Alive or Ninja Gaiden, to the overuse of the damsel in distress trope in popular titles, such as the Super Mario series, the under- and misrepresentation of females in video games has been well documented in several content analyses. Enlisting a 3 year longitudinal design, the present study assessed the relationship between video game use and sexist attitudes, using data from a representative sample of German players aged 14 and older (N=824). Controlling for age and education, it was found that sexist attitudes-measured with a brief scale assessing beliefs about gender roles in society-were not related to the amount of daily video game use or preference for specific genres for both female and male players." 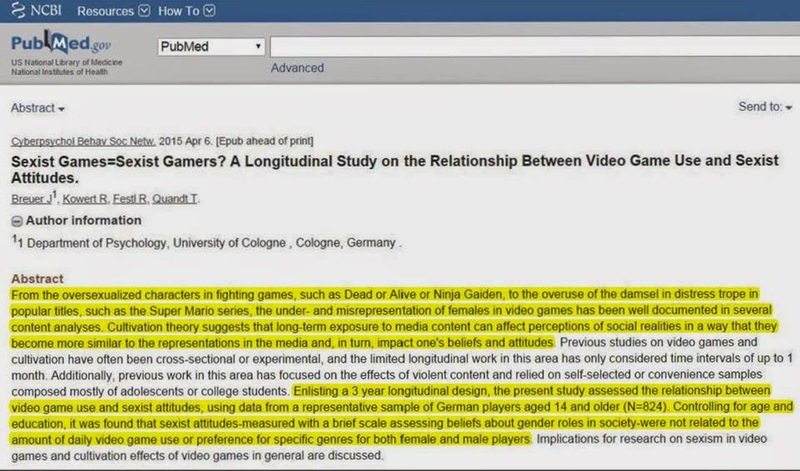 So next time we are told by the feminists that video games and gamers are sexist misogynists, we can objectively and factually slap these statistical studies onto their faces.